Acadia Pharmaceuticals is a leading biopharmaceutical company dedicated to developing and commercializing innovative therapies for neurological and related central nervous system (CNS) disorders. As communications agency Fox + Gazelle designed a sleek new corporate website for Acadia, they worked closely with Medium Well for site development, programming and implementation (more on Agency Support). Integrate the website’s Careers section with the Oracle Taleo recruitment system, and the Investors and Media sections with the Thompson Reuters/Nasdaq investor relations system. 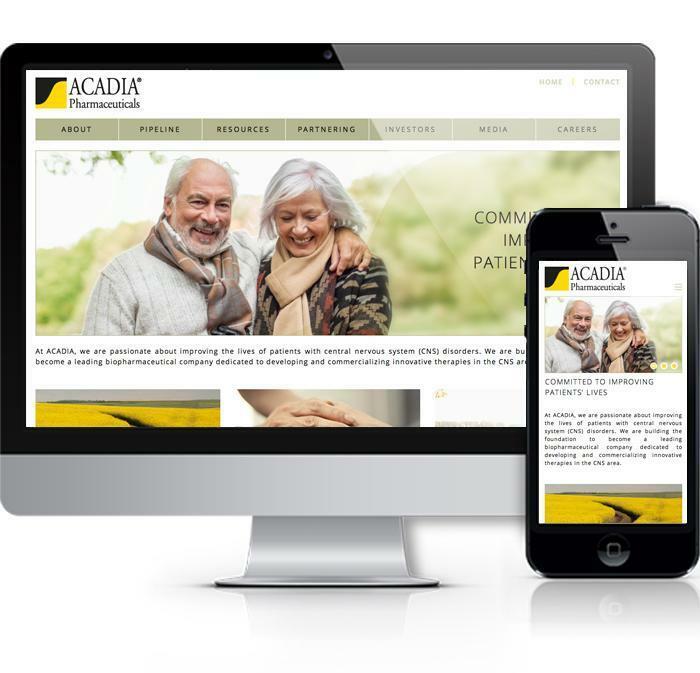 This included customizing templates to ensure the information from their domains appears in the designated Acadia website styles. To achieve these goals, Medium Well built a custom, responsive website that provides a first-rate user experience and showcases a large amount of content in a dynamic, easy-to-view way. The site was built to match PSD files provided by Fox + Gazelle, which included matching custom font styles to exact design specifications. As the external-facing part of the website has a custom design, so does the back-end. The site has a WordPress content management system (CMS), set up to make it easy for novice administrators to update content, even for the pages with high-end design components, such as leader profiles and company timeline. Despite an unusually short lead time for development during November-December holiday time, and in-depth client review process, the complete site was launched on time. NOTE: In May 2015, Medium Well became Harris Web Works. This project was completed while we were still Medium Well.